At Heidi’s Events and Catering we understand more than anyone else how planning your wedding is exciting, but can be sometimes overwhelming. We want to help you! We bring you limitless customer service fueled by creative passion. Heidi’s Events and Catering is leading our industry with cutting edge food, presentation, and people. Call us today to set up a time to visit our lovely showroom. 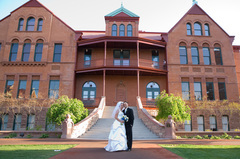 We look forward to showing you how we can make your wedding day just the way you have dreamt it would be! Heidi’s staff was professional and easy to work with. We worked with Drew and he was so helpful. He even called me a couple times to make sure everything they selected for my wedding was just right. They handled so much for me and it was a huge stress relief. Their food was so delicious! All of our guests raved about how it was the best food they had ever had at a wedding and how their napkins were refolded each time they left their seats. I felt so proud to have chosen such a good vendor. 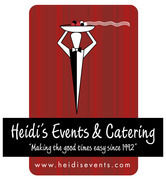 I highly recommend Heidi’s for any event requiring a caterer. They did it all! Set-up, tear down, decorating and attending to our and our guests every need. The food was excellent. Heidi was respectful of our budget. Drew and the rest of the team was AWESOME!!! The team was so easy to work with and so helpful. My dad and stepmom couldn't stop praising the staff at our wedding!